What is myBooks Online Accounting Software? 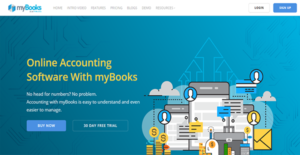 myBooks Online Accounting Software by Zetran Corporation is a cost-effective, web-based, and simple accounting application that is equipped with essential features for small businesses. It has an intuitive and easy-to-use interface that promotes quick learning of accounting tools and concepts. With this gentle learning curve, small-sized companies do not need to expend for professional accounting services. myBooks Online Accounting Software is also a unique solution as it has an in-built automation capability. This means that credit cards and bank accounts linked to the cloud-based program are processed immediately for transactions, regardless of the currencies involved. This abstracts complicated foreign exchange processes, so you can focus more on tasks that require immediate attention. Moreover, myBooks Online Accounting Software provides stringent security to your company’s financial information. With its enterprise-level data protection, you can conduct business without worrying about external intrusions. Unlike other accounting systems, myBooks Online Accounting Software has simple enterprise pricing levels. There is also a free version available that has limited functionalities but still as robust as the paid bundles. Additionally, signing up for the solution is easy so you can utilize it for your business accounting immediately. If your company has transactions in foreign currencies, you may have experienced challenges converting the amounts. When you employ myBooks Online Accounting Software for your financial management, you no longer have to make conversions as the solution takes care of that automatically. This way, you can focus more on building profitable relations. myBooks Online Accounting Software can connect with your bank accounts to provide you with automated bank feeds on your dashboard. This means that if you have multiple accounts with different banks, you can manage them from a single interface. This helps you save time and gives you more visibility into your finances. Invoicing is made less tedious by myBooks Online Accounting Software. The solution is equipped with an invoicing template that you can simply fill in when you need to send one to a client or partner. With this, you can reduce data entry and be more consistent with your formats. In the center of myBooks Online Accounting Software are accounting insights. These are arranged in an easy to understand and digestible manner to allow you to make quick yet smart business decisions. What Problems Will myBooks Online Accounting Software Solve? With myBooks Online Accounting Software, there is no need to acquire the services of an IT consultant, if there is none already in the company. This allows the business to be sufficient in itself and save time and money. Accounting professionals can have expensive services and this is daunting for a small business. That is why myBooks Online Accounting Software is developed to have a user-friendly interface that makes it easy for anyone to understand accounting concepts. Thus, small companies need not to hire an accountant to help them with their finances. myBooks Online Accounting Software integrates with supported banks to offer up-to-date information regarding the inflow and outflow of money. While it does that, the software also has stringent security measures to make certain that a company’s finances are protected against potential threats. Since each enterprise has particular business wants, it is advisable for them to desist from looking for a one-size-fits-all perfect software solution. Needless to say, it would be futile to try to find such a system even among popular software solutions. The clever thing to do would be to jot down the various important aspects that need consideration such as key features, budget, skill levels of staff members, company size etc. Then, you should do your homework thoroughly. Read some myBooks Online Accounting Software reviews and look into each of the other systems in your shortlist in detail. Such comprehensive homework can ensure you weed out ill-fitting applications and choose the solution that offers all the aspects you require for business success. How Much Does myBooks Online Accounting Software Cost? Zetran offers two levels of enterprise pricing for myBooks Online Accounting Software. There is also a free version of the software with limited capabilities. To help you decide which package is the best for you, their inclusions are listed below. We realize that when you make a decision to buy Accounting Software it’s important not only to see how experts evaluate it in their reviews, but also to find out if the real people and companies that buy it are actually satisfied with the product. That’s why we’ve created our behavior-based Customer Satisfaction Algorithm™ that gathers customer reviews, comments and myBooks Online Accounting Software reviews across a wide range of social media sites. The data is then presented in an easy to digest form showing how many people had positive and negative experience with myBooks Online Accounting Software. With that information at hand you should be equipped to make an informed buying decision that you won’t regret. What are myBooks Online Accounting Software pricing details? What integrations are available for myBooks Online Accounting Software? myBooks Online Accounting Software can integrate with your bank to show your automated feeds on your dashboard. Pros: Accounting feature avaialble for fiannacial report generation , multicurrency , bank feesds. Good support from their support team. Speed of the software also very good, Excellent value for your money. Cons: Need more third party integration tools . Pros: I’m using myBooks accounting software for managing the accounts of my business and find the software extremely reliable. I didn’t have to waste time learning how to use it as it is intuitive, and the configuration is easy, as well. myBooks accounting software is easy to understand and has a simplified UI. This enables me to invest my time in the business than on accounting. Accounting feature avaialble for fiannacial report generation , multicurrency , bank feesds. Good support from their support team. Excellent product, very easy to use and cost-effective. Easy to use interface and low costs. Most of the transactions are very intuitive to create. If you need more information about myBooks Online Accounting Software or you simply have a question let us know what you need and we’ll forward your request directly to the vendor.